England captain Alastair Cook says he does not remember talking to umpires about Steven Finn's tendency to break the stumps in his delivery stride. Finn had Suresh Raina caught at slip in the fourth one-day international but umpire Steve Davis called dead ball. The umpires said they warned England that would happen after the first ODI. Cook said: "Apparently the umps were pretty clear that they had told us that so I must have been deaf when I was listening to them." The match officials are understood to have notified England that any further disturbance of the stumps would lead to a dead ball after Finn twice knocked the bails off in the first of the five-match series. Raina, who was on 41 at the time, went on to make an unbeaten 89 as he led the hosts to a five-wicket win. "There was a little bit of confusion," said Cook. "Apparently we had been told that because he knocked them over twice in one of the previous games he was a 'serial offender' and that he was going to get called straight away. "In the heat of the moment I think a few of us might have forgotten that. Whether we'd been told that, I wasn't entirely sure. "You've got to clarify these things. I couldn't remember the conversation but they're convinced they had it and I'm going to have to take their word for it." "Either umpire shall call and signal dead ball when the striker is distracted by any noise or movement or in any other way while he is preparing to receive, or receiving a delivery. "This shall apply whether the source of the distraction is within the game or outside it. The ball shall not count as one of the over." Cook also seemed unhappy that Finn has been singled out, and thinks it might be because Finn's tendency to disturb the bails at the non-striker's end had been brought to the attention of the same umpire last summer. South Africa Test captain Graeme Smith complained about being distracted and Davis did not give the batsman out when Finn had seemingly dismissed him in the Headingley Test. 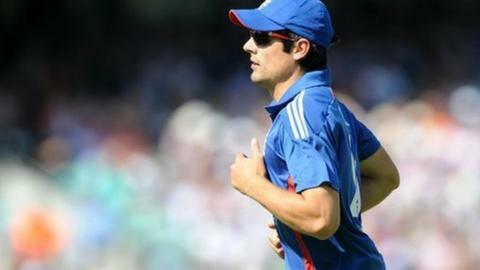 Cook said: "Bowlers have knocked the stumps off before. It's only because Finny did it a couple of times in that South Africa series that it's happened. "Finny's bowled 60 balls today and he knocked them off once, so he's probably bowled 61 with the dead ball. "I know it's a tough job for the umpires but it's obviously frustrating because at that time that wicket would have put us in just a slightly better situation than we were. "It's obviously frustrating when those little things don't go your way." Despite India taking an unassailable 3-1 lead in the series, Cook was pleased with his side for a much-improved performance. England were bowled out for 158 and 155 in the previous two matches but made 257-7 in Mohali. "We stuck in there with the bat," Cook said. "Throughout the first 30-40 overs it nipped around for the seamers. We did have the real tough end of conditions, but we held our nerve, which we had not done in the last two games. "We can take really good stuff out of it. The last two games we couldn't really do that." India skipper Mahendra Dhoni paid tribute to his side for closing out the series and singled out Rohit Sharma, who scored 83 in his first ODI for over a year, for praise. Dhoni said: "We all know Rohit is a gifted cricketer and it was a very good performance from him. He is a natural puller of the ball and once he got to his 50, he converted it to a big one. "The conditions in this series have not been typical subcontinent conditions, except Kochi, so to win has been a good achievement."